Internationally, Anouk is probably known for last year’s Eurovision entry ‘Birds’, but the Dutch music scene explodes whenever she releases something new. There’s a good reason for that: Anouk is Holland’s best (and best selling) female Rock singer and she understands the power of scarcity. Granted, she doesn’t play live much simply because she doesn’t want to, but it does keep her in demand. ‘Paradise And Back Again’ is her ninth studio record and though it isn’t on par with the underrated diamond ‘Graduated Fool’, it’s another strong album with mainly her Soul, Blues and Pop influences at the forefront. The album’s live feel is part of its charm as well. Let’s get some criticism out of the way first. ‘Paradise And Back Again’ is a front-loaded album. This is especially true when you have the limited edition that closes with three electronically oriented tracks that have Anouk performing well, but because of the sudden stylistic shift, they rather stand out like a sore thumb. But also without those bonus tracks, the album doesn’t exactly close on a high note. Having said that, the album does contain a large number of fantastic grooves. Many Dutch reviewers have pointed out that the album is conceptually weaker than its predecessor, but I do think the songwriting is better. Not so long ago, a lengthy interview with Anouk in the TV show College Tour was aired and she closed it off with excellent performances of ‘Looking For Love’ and opening track ‘Cold Blackhearted Golddiggers’. Those performances made me very hungry for this album and the two songs are definitely among the album’s highlights. Especially the former, with its overwhelming vocal work and monstrous groove, but the latter is a fantastic, darkly brooding Blues track that serves as the perfect introduction for ‘Paradise And Back Again’. For me, ‘Don’t Wipe Us Out’ is the highlight of the album. The song is built upon one of the most awesome bass lines I’ve heard this year, while the climaxes of the song are reached by adding or removing layers of instruments. That killer bass stays though. ‘She Is Beautiful’ is a well-crafted Pop song with a Daptone vibe in its intro, ‘Daddy’ contains one of Anouk’s most spirited performances of the album, not to mention some of the best lyrics and ‘Last Goodbye’ is a short, genre-defying Pop song. ‘Wigger’ has more depth than its title may suggest and I somehow really like the creeping vibe of ‘Some Of Us’. Okay, so there’s no classic like ‘Jerusalem’ or ‘Everything’ on this record, but give it some time and the album will grow on you. This is mainly due to its more subdued nature; the songs have a way of revealing their secrets slowly rather than punching you in the face with them. That is what characterizes ‘Paradise And Back Again’ and it is also its redeeming quality, no matter what you might think upon first listen. What the first listen will reveal, though, is that Anouk has a fantastic voice and a knack for writing good hooks. That should keep us satisfied until she wants to play live again. And admit it: that album cover is awesome! While a lot – if not all – of Dr. John’s albums are a celebration of all things New Orleans, nowhere else is the tribute to his musical heritage nearly as obvious as it is on the two collections of New Orleans classics known as ‘Dr. John’s Gumbo’ (1972) and these fantastic recordings from two decades later. 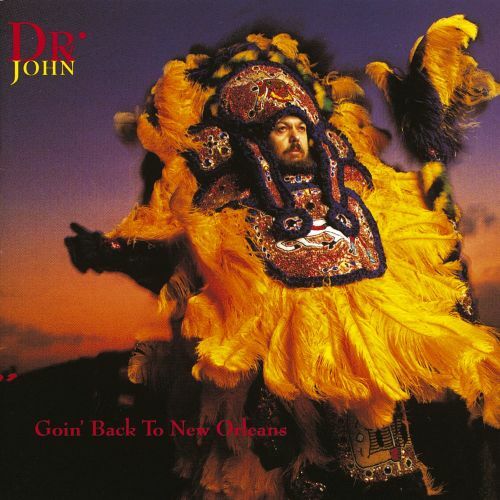 In a way, the album is also sort of an artistic reawakening for Dr. John after a somewhat unproductive decade. No matter how you view ‘Goin’ Back To New Orleans’, it’s an enjoyable listen. If only because of the celebratory nature and spirited performances by every musician involved. Part of what makes the album work so well is that the Doctor is working with some veterans of the scene, including Danny Barker, Al Hirt and the Neville Brothers. The chemistry is alive and well throughout ‘Goin’ Back To New Orleans’; it’s obvious that everyone involved had the shared enthusiasm for bringing new life to these New Orleans classics. That spirit would be reason enough to go out and buy this record immediately, but it’s also clear that Dr. John put a lot of effort into selecting a range songs and thinking of the order in which they worked best. That alone warrants the presence of eighteen tracks. Amongst the tracks selected are traditionals that have been done by everybody, such as ‘Careless Love’ and a particularly swinging version of ‘Goodnight, Irene’ – have you ever heard that song with such awesome horns? – there are also a few less predictable inclusions. The album opens with the very atypical ‘Litanie Des Saints’, Dr. John’s tribute to classical composer Gottschalk. The song has a classical vibe to it, but there’s also something African and something Caribbean to the rhythms. It took some time getting used to it, but it quickly became one of the most beautiful pieces I have ever heard. Other highlights include ‘Do You Call That A Buddy?’ with its exciting vibe, Jelly Roll Morton’s ‘I Thought I Heard Buddy Bolden Say’, which has a vocal cameo by Danny Barker, who actually knew Buddy Bolden, and the cynical Blues of ‘How Come My Dog Don’t Bark When You Come Around’ with the Doctor himself ad-libbing brilliantly near the end. However, the perfect closing statement is the title track. The horn arrangement just pops, the choirs by the Neville Brothers are exuberant and the Afro-Cuban rhythms and piano parts make even me want to get up and dance. Joe Liggins’ original is amazing, but this is the ultimate version of the song. Dr. John’s New Orleans class is complete with his extensive liner notes, in which he explains the history of the songs he’s tackled here and whose versions inspired him most. It accompanies the music perfectly and makes the album so much more than just another album by the musical genius that is Dr. John; it makes ‘Goin’ Back To New Orleans’ sort of an archive release by an enthusiast who wants people to learn as much about the vast musical history of New Orleans as possible. But even when you approach this as “just an album”, it’s an incredibly enjoyable one with a very long lasting impact. A must for any music fan. Some legends of Heavy Metal have their praise based on an incredibly small amount of output. For many of the unsung heroes of the NWOBHM movement, only a handful of singles remains as a monument to their supposed brilliance. California’s Warlord has recently expanded their catalog a little, but for a while, two half-hour albums were all the band had going for them. The praise they got, however, was more than deserved. While their original oeuvre predates the term Power Metal, that’s exactly what it is. And the whole thing sounds remarkably sophisticated for the genre too. Despite the consistent input of drummer extraordinaire Mark Zonder, Warlord is and will always be the brainchild of guitarist William J Tsamis – “Destroyer” in the credits. His classy riffwork and unorthodox approach to Heavy Metal songwriting – some things he said in interviews may make one doubt if he ever actually liked the genre – are what make Warlord’s music. Listen no further than the semi-title track to this debut EP of theirs; ‘Deliver Us From Evil’ counts as an ultimate Heavy Metal classic through its triumphant main riff, marching rhythm, subtle keyboard flourishes and beautiful vocal harmonies. And that brings us to one of the other redeeming factors of ‘Deliver Us’. Singer Jack Rucker – “Damien King I” in the credits – isn’t your typical Heavy Metal singer in the sense that he doesn’t have the raw, primal power that is normally associated with the more traditional variation of the genre, but his voice fits the ethereal quality of the melodies on ‘Deliver Us’ so well that it’s hard to imagine these songs with a different singer. He carries the changes in atmosphere in the brilliant ‘Penny For A Poor Man’ with remarkable ease. It borders on unbelievable that Rucker never did anything of particular relevance in the Metal scene after leaving Warlord, because his vocal performance here is among my favorites in the history of the genre. ‘Child Of The Damned’ is one of the more popular songs on the album due to inclusion on the Metal Blade compilation ‘Total Destruction’ and HammerFall covering the song much later. It is definitely the most explicitely uptempo song on the album and benefits from a great riff and fantastic double bass work by Zonder. Even better is the ‘Metal Massacre III’ inclusion ‘Mrs. Victoria’, due to its darker, ominous tone. That one’s only included on the re-release of ‘Deliver Us’, but it definitely rounds out the release. The more tranquil ‘Winter Tears’ is another brilliant track with a great vocal part courtesy of Rucker. It’s easy to understand why ‘Deliver Us’ has earned its classic status. It’s a classy Power Metal album with a unique approach to Heavy Metal songwriting. The expert musicianship from everyone involved does the rest. Tsamis and Zonder have continued the Warlord legacy intermittently throughout the years and although they’re still releasing quality material, but the way all the starts have aligned for ‘Deliver Us’ is a rarity. A rarity waiting to be heard. While many old school Heavy Metal bands had an enormous identity crisis in the nineties due to the rise of Alt-Rock and – in this case – Visual Kei, Naoto Shibata did the right thing; he put his band Anthem to rest until new artistic and business opportunities presented themselves. The result: Anthem exclusively released solid, quality Heavy Metal records throughout their career. ‘Absolute World’ is one more piece of evidence proving that the band can still make fantastic records over three decades into their carreer. In fact, it is on par with ‘Immortal’ and ‘Black Empire’ as the band’s best post-reunion albums. Iconic singer Eizo Sakamoto left the band after the album’s predecessor ‘Burning Oath’. His replacement – for the second time in Anthem history – is Yukio Morikawa, who has obviously aged since he last worked with the band on ‘Domestic Booty’, but still has a set of pipes many young singers can be jealous of. Admittedly, I sometimes miss Sakamoto’s primal energy, but Morikawa’s performance on the album is stellar. In addition, Isamu Tamaru became the band’s full time drummer, after replacing Hiro Homma during his injury. However, what counts in the end are the songs and Shibata has once again written a collection of fantastic Heavy Metal and Power Metal tracks. 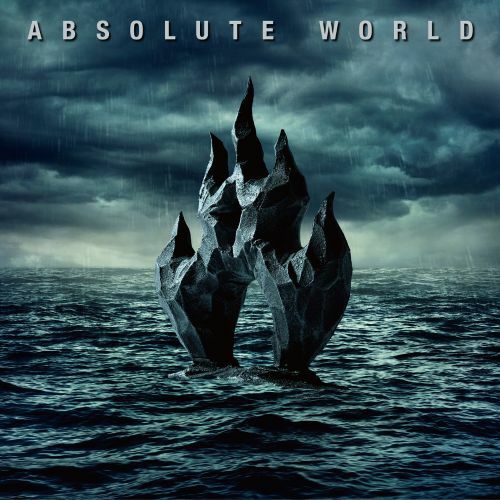 Throughout recent years, many keyboards carrying the main melodies crept through Anthem’s songs, but ‘Absolute World’ is very much a guitar riff driven album. Opening track ‘Shine On’ misleads you for a second, but turns into a fantastic Power Metal track – as well as the most logical first single – with a couple of fantastic melodies courtesy of Morikawa. Furthermore, there’s an awesome 2 minute Speed Metal track in the shape of ‘Destroy The Boredom’, as well as the blazing ‘Stranger’ with its fantastic chorus and the driving ‘Pain’. From the moment he joined, guitarist Akio Shimizu quickly became an important part of the band. His contributions here include his usual instrumental track (‘Absolute Figure’) and the more traditional Power Metal tracks ‘Edge Of Time’ and ‘In The Chaos’, which both build upon strong riff work and fantastic choruses with spirited performances by Morikawa. Shimizu also throws around some of the sickest guitar solos in contemporary Metal, most notably on the brooding midtempo masterpiece of a track ‘Sailing’ and the closing triplet riff monster ‘Run With The Flash’. Shibata himself, meanwhile, has an incredible bass sound. In the end, the only bad thing about ‘Absolute World’ is that no European or American label has the balls to release an album that has mostly Japanese lyrics and therefore, the album is quite expensive. That and the fact that ‘Love Of Hell’ is about a minute and a half longer than it should be. But those are just minor complaints that in no way ruin the enjoyment of one of the best old fashioned Heavy Metal records in recent times. Not even the financial aspect. It helps that Shibata isn’t only a great riff writer, he’s a great songwriter with a bunch of fantastic musicians around him. If that doesn’t make a fantastic Metal album, I don’t know what does. Comeback albums are always something of a risky breed. If you stick too close to your original formula, critics will scold your lack of originality and doubt the purpose of your reunion, but trying something new will alienate your fanbase. At The Gates has found the magical middle ground by picking up where they left things about two decades ago. 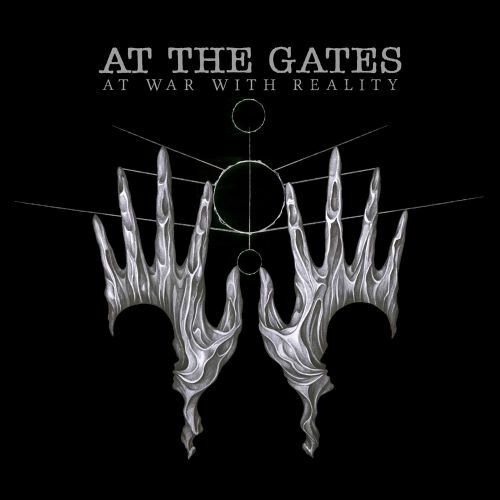 All the more remarkable is the fact that ‘At War With Reality’ even got recorded after the assertion that the 2007 reunion tour would be the final chapter to the story of the Swedish melodic Death Metal pioneers. This fantastic album definitely justifies the decision to continue though. At The Gates fans have always been split up into two camps. There’s the fans of the more streamlined approach of the massively influential ‘Slaughter Of The Soul’ album and there are those that prefer their darker, more complex, but also uncharacteristically sloppy earlier work. Despite the presence of more ominous material such as ‘Order From Chaos’ and ‘Heroes And Tombs’, ‘At War With Reality’ is more likely to please the former crowd. The songs are relatively concise, most of them only slightly past the three minute mark and built upon their oft-imitated, but never quite equalled formula of Thrashy Melodeath riffs and Tomas Lindberg’s anguished howl. Somehow, it’s a little tragic that none of the imitators has improved upon the At The Gates formula, but it’s amazing to hear the true masters at work here. And they’re still as energetic as they were the first time around. That makes sense, because the band members were really young when the band first split up. Also, they have all been active ever since. That combination of somewhat youthful energy and experienced musicianship makes this album both musically satisfying and well…headbangable. A revelation in a time when most Death Metal bands are usually just either one of those. With yours truly being somewhat of a Thrash fanatic, my favorites are generally the Thrashy riff monsters like ‘Upon Pillars Of Dust’, ‘The Circular Ruins’, ‘Eater Of Gods’ (that one has a surprisingly atmospheric second half though) and the supreme aggression of ‘The Book Of Sand (The Abomination)’. However, the band also excels at the more atmospheric experiments, most notably on closing track ‘The Night Eternal’ and the moving, dramatic ‘The Head Of The Hydra’. And the main riff to ‘The Conspiracy Of The Blind’ is so warmly reminiscent of ‘Suicide Nation’ that it’s a guaranteed classic. In the end, I can only wonder where Anders Björler has been hiding all of these fantastic riffs all these years. He certainly didn’t use anything similar for The Haunted. Combined with an explosive mix, ‘At War With Reality’ is one of the best melodic Death Metal albums in a long time. It just may be a little awkward for every band that had been unsuccessfully trying to copy the At The Gates formula after their dissolution that these guys are still better. A lot better. And Tomas Lindberg’s desperate scream is still better than any grunter in the genre.